Examples of ad design for use in Panache Vue' Magazine. As Media Sales Specialist, Panache Vue' Magazine I design some of the ads for non-profit organizations, and my personal clients. 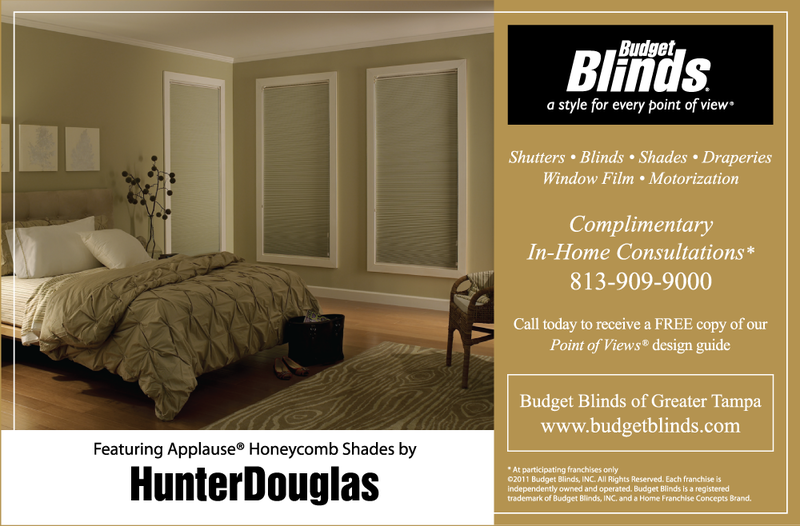 Budget Blinds, from Land O' Lakes, FL is one of the clients that I serve. Modeled after a corporate ad that ran in the previous issue, I included a photograph showing window treatments by Hunter Douglas. I added black to the background of the Budget Blinds logo, for balance. The other changes were minor and involved text in the special offers. With a franchise, it is best to design in their style so that ads can be approved quickly by their corporate office, and so that their branding is intact. They were very happy with this clean, smart-looking design.